Why Is FEMA Failing Florida, Texas, and Puerto Rico? Every American disaster consists of two body blows: the one delivered by Nature, and the other given by the government. According to media reports, Americans in post-disaster areas are still awaiting aid from the Federal Emergency Management Agency. Not just in Puerto Rico; in Houston and Florida, aid has been delayed. The President, surprising nobody, gave his own performance and the performance of the government “an A-plus.” That would never have occurred to persons on the ground, but the mortals of America are not possessed of the Chief Executive’s extraordinary senses and labyrinthine sense of empathy. The farseeing brain of Trump, the farseeing eyes of Trump, the far-going appetite of Trump are not given to many people. What we do see, when we choose to depart from our fabulous President’s dream world, is another matter entirely. FEMA officials have pleaded extraordinary circumstances in their dull plodding and delayed rendering of comfort to American citizens. The Agency claimed poverty, and ill-preparedness—two factors that never seem to appear when the Agency is run by Democrats—and that they are operating during hurricane season, the very season they were designed to endure. Imagine a car engine complaining that it had never seen so many horses to outrun! Consider a toothbrush whining that there had never been so many teeth in one mouth! And, finally, if you would, weigh for a moment how FEMA’s excuses of dealing with extraordinary disasters must sound to the people on the ground. Who have to live with the quite ordinary wreckage of their cities, streets, homes; of seeing not just their livelihood and their children’s shelter smashed into matchsticks—but similar circumstances endure over everybody they know, their friends and neighbors, and you get an idea of how little the defense of FEMA impresses the world. Think of how the world looks when such sights become everyday, and not extraordinary. According to interviews with dozens of storm victims, one of the busiest hurricane seasons in years has overwhelmed federal disaster officials. As a result, the government’s response in the two biggest affected states — Texas and Florida — has been scattershot: effective in dealing with immediate needs, but unreliable and at times inadequate in handling the aftermath, as thousands of people face unusually long delays in getting basic disaster assistance. It has been sixty days since Harvey burgled Texas. August 25th, it was. It has been six weeks since Irma ravaged Florida, rattling every storm door and punching in the windows. Off went the roofs! Up went the ocean! The trees rebelled as well, throwing themselves on the ground as if in prayer. Wet storms, wet from the sea, infinite abundances of storm, ripping soil from farms, turning the houses tops-turvy, violent crashes and calamities in attics, living rooms, basements. Litter of wood, glass, stone, everywhere. Water everywhere; in the cellar and in the streets, pouring from the sky and emptying the ocean. Water. We know these catalogs by now. The sufferings have been broadcast everywhere. FEMA, with its armies, has taken its sweet time to inspect the throttled homes and properties of the afflicted people. A monstrous backlog, and never enough investigators—a wait of forty-five days at a time, a month in Florida. After Katrina, according to the Times, “People who called FEMA in the immediate aftermath of Katrina waited an average of 10 minutes before speaking with a representative, and weeks later that wait dropped to five minutes, according to a 2006 report by the inspector general’s office for the Department of Homeland Security, which oversees FEMA.” Maria, Harvey, Irma have shown the limits of FEMA’s abilities. When disaster-stricken citizens called the government help line in the year 2017, they were made to wait hours upon hours for service. This, in the supposed Developed World, with a developed conscience. Are these the “human rights” that John Kelly purported to teach the rest of the world? This is the first dress rehearsal for the neoliberal, post-climate-change world that the governments of the West are trying to build: where populations are disposable, and some people are made to wait longer than others. Normally, the disregard of our society falls hardest of the poor and marginalized. 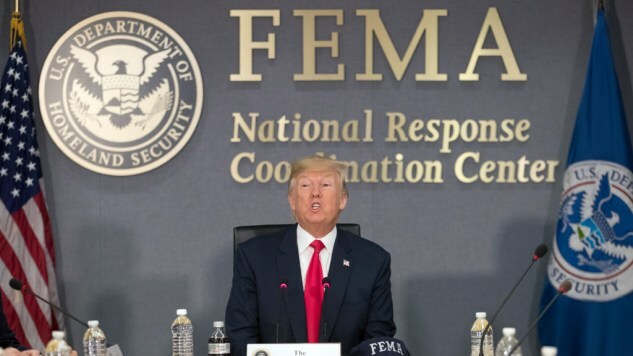 What is unique about the latest round of FEMA scandals is that the lash lands on Trump’s voter class, the suburbanites. The best thing you can say for FEMA’s actions is that they are not the truly monstrous responses of the private sector, which would charge a dying man a hundred dollars for a bottle of water. The true measure of any human being is what they do when they are under stress, and the best indicator of a government’s competency and its empathy is how it handles itself when its constituents are waylaid by tragedy. And we see the stuff that Trump, and Trump’s government, and FEMA are made of. Help is given twice when given quickly, and caring is halved when it arrives too late. Jason Rhode is a staff writer for Paste. He’s on Twitter @iamthemaster.